A Southampton Clinical Doctoral Research Fellow’s quality improvement project into reducing falls among elderly people with dementia, has been shortlisted for a prestigious national award. The internationally recognised Clinical Doctoral Research Fellowship (CDRF) Scheme is the largest and most advanced of its kind in the UK and is aimed at early career allied health professionals, nurses and midwives aspiring to become clinical academic leaders of the future. CDRF student and physiotherapist Ana-Carolina Goncalves has been named as a finalist for the Chief Allied Health Professionals (AHP) Officer’s Quality Improvement Award for her project Reducing rates of patient falls in an in-patient older persons organic mental health ward. Ana-Carolina splits her time between working as a physiotherapist in a dementia ward for older people at Solent NHS Trust and the University: “There were problems in my clinical role, in that we had too many patients that were having falls. Our patients are often very confused and agitated and all of this contributes to the increasing likelihood of them having a fall. I got a team of nurses, physiotherapists, occupational therapists, support workers together to see what we could do to reduce the number of falls on our ward. “Supported by the Trust’s Quality Improvement Programme, we looked at ways in which we could reduce the risk of these patients having falls,” said Ana-Carolina. The results of the research generated two fairly minor, but ultimately significant, changes to ward practice that saw the number of falls among patients reduce over a six-month period. Firstly, any falls were clearly marked on patients’ clinical notes with the date the patient fell. This enabled ward staff to see which patients had recently suffered a fall. Secondly, prompts were added to patients’ notes prior to weekly doctors’ rounds, facilitating deeper discussion around the fall and whether anything could be done to improve the patient’s care. This quality improvement project found that these two measures reduced falls from 3.8 to 1.8 falls per 100 occupied bed days. Ana-Carolina’s work so impressed the Solent NHS Trust Research and Development department and they nominated her for the AHP award. The awards are an important opportunity to celebrate the significant contribution and impact of the AHPs to improving health, care and well-being, at both a population and individual level across the life course. Ana-Carolina previously worked as a physiotherapist in a private clinic in her home country of Portugal. 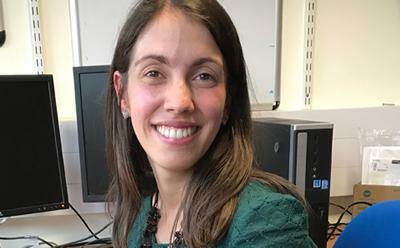 She said: “I wanted a change and I wanted to do research, so I was fortunate enough to get some EU funding to come to the University of Southampton to do a research internship. However, I missed my patients, so when I saw this joint role as a Clinical Doctoral Research Fellow it was perfect. A special ceremony is due to be held in London on June 19 where Ana-Carolina will find out if she has won. Ana-Carolina’s PhD research was also recognised at the recent University Medical and Health Research Conference where she was awarded the Health Sciences prize for best research publication by a postdoctoral researcher.